Autism is a developmental disorder. It is known as a spectrum condition, both because of the range of difficulties that affect adults with autism, and the way that these present in different people. Autism occurs early in a person’s development. Autism affects the way a person communicates with, and relates to, other people. It also affects how they make sense of the world around them. On its own autism is not a learning difficulty or a mental health problem but some people with autism do have a learning difficulty or mental health issues. People with autism are much more likely to experience social isolation, mental health issues and difficulties in accessing employment. Gathering data on the numbers and needs of people with autism at a local level is challenging as historically services have not collected comprehensive data about this population. Autism is a relatively ‘modern’ diagnosis; the term ‘autism’ only came into common clinical use in the 1960s and whilst most diagnosis now occurs in childhood many adults remain undiagnosed. There are around 700,000 people in the UK with autism – that’s more than 1 in 100. This is equivalent to approximately 2,700 adults and children in South Gloucestershire. Although the prevalence of autism is not expected to change, as the number of people living in South Gloucestershire increases, so too will the number of adults with autism. The estimated number of adults aged over 18 with autism is predicted to rise from 2,111 in 2014 to 2,401 in 2030. Statistically autism is almost 5 times more commonly diagnosed among males than females. However, there is research that suggests that autism is under-diagnosed in females, so the male to female ratio may be closer. South Gloucestershire patients access the Bristol Autism Spectrum Service. Services provided include IT equipment, sensory equipment, library services, and awareness training. Nationally 70% of adults with autism say they are not getting the help they need from social services and that with more support they would feel less isolated. The National Autism Service Avon Branch completed a survey in Oct/Nov 2014. Of the 73 responses, the main issues arising included unacceptably long waiting times for a diagnostic assessment; need for better access to advice and money management, speech and language therapy, and social groups; better understanding among employers; the importance of quality and choice; need for more knowledge among social workers; and more need for services for those who are highly-functioning but don’t have a learning difficulty. A full needs assessment to be undertaken to ensure that the right support for people with autism is available at the right time during their life time. This should include diagnostic services, good transition support for young people with autism moving to adult services, and that the changing needs of people with autism are planned for as they grow older. Ensure that frontline staff including GPs are able to identify potential signs of autism, refer to support services when necessary, and understand how to make reasonable adjustments in their behaviour and communication. Gathering data on the numbers and needs of people with autism at a local level is challenging. Autistic spectrum conditions are likely to be more prevalent in younger age groups as they were only formally recognised as a group of conditions in the late 1960s. There may be older people with autistic spectrum conditions who were never diagnosed as such. Gathering data on the numbers and needs of people with autism at a local level is challenging as historically services have not collected comprehensive data about this population. Autism is a relatively ‘modern’ diagnosis; the term ‘autism’ only came into common clinical use in the 1960s and whilst most diagnosis now occurs in childhood many adults remain undiagnosed. Autism is much more common than many people think. There are around 700,000 people in the UK with autism – that’s more than 1 in 100. This is equivalent to approximately 2,700 adults and children in South Gloucestershire. Statistically autism is almost 5 times more commonly diagnosed among males than females. However, there is research that suggests that autism is under-diagnosed in females, and therefore the male to female ratio of those who have autism may be closer. The ratio of male to females who use The National Autistic Society (NAS) adult services is approximately 4:1, and in those that use NAS schools it is approximately 5:1. There were 22 adult referrals from South Gloucestershire GP practices to the Bristol Autism Spectrum Service from April to September 2014. Fourteen diagnostic assessments were completed (8 in males, 6 in females) with the largest number (5) in the 20-29 age group. All referrals were of White British ethnicity. As of the 30th September 2014, there were 42 individuals waiting for diagnostic assessment on the South Gloucestershire waiting list and the average time that people had to wait before they were seen for diagnosis was 10 months. There is a range of services and sources of support available to people with autism in South Gloucestershire. Whilst some of these services are health and social care services, the community and voluntary sector play an important role in providing interventions such as information & advice, advocacy, outreach, social groups, and occupational opportunities. This action plan is currently being reviewed and updated and will be informed by this JSNA section and planned future needs assessment. Over the past 7 years, Bristol Autism Spectrum Service (BASS) has become the leading NHS provider of diagnostic and post-diagnostic services to adults with autism in the UK. They are regularly referred to as a national example of best practice, and are cited in both the recent NICE guidance and the Department of Health autism strategy (page 24). Given the financial limitations that exist currently in healthcare commissioning, South Gloucestershire CCG have worked closely with BASS to develop a model of provision that is both fully compliant with the demands of NICE, and is able to deliver a highly effective, person-centred service to people on the autism spectrum. This service model has been implemented in many CCG areas across the England and N Ireland, and the team regularly consult with commissioners around the country with regard to how to develop good quality, inexpensive provision for people with autism. More locally, BASS has an excellent track record of providing high-quality, cost-effective services for adults with autism across several local CCG areas. BASS currently operate services in Bristol, North Somerset and B&NES, all of which are highly regarded by both commissioners and service users, and are key partners in several high-profile NIHR-funded research projects around the delivery of services to this client group. The proposed autism service in South Glos would directly benefit from the skills present in the wider BASS team, and would have access to all the innovative clinical and research activities undertaken by the service. Recent examples of these innovations include: the development of a novel, evidence-based 16-week social skills course (already piloted, and soon to be published), autism-friendly group CBT interventions for anxiety, specifically-adapted 1:1 CBT for social anxiety, and a new guided self-help treatment intervention for adults with autism with mild/moderate depression. Assessment and diagnosis is undertaken by expert autism clinicians, all of whom have received comprehensive training and ongoing supervision from nationally-recognised specialist practitioners. Given that the assessment of developmental disorders in an adult population is a highly complex and time-consuming task, the fact remains that good quality, evidence-based diagnostic assessment inevitably takes a significant amount of time, and requires highly skilled, specialist professionals. The NICE guideline in particular is very prescriptive around the level of expertise and technical skill required to conduct diagnostic assessments for autism, in addition to mandating the use of specific, “gold-standard” interview schedules. However, it is important to emphasise – BASS are constantly looking at ways to innovate and develop better, faster, cheaper ways of conducting assessments, without compromising on quality. In addition to the provision of high-quality diagnostic assessments, BASS are involved in the continuation and development of the South Gloucestershire Autism Advice Service. As part of the CQUIN initiative the ‘Autism Advice Service’, consisting of an early intervention service was run very successfully in partnership with the local authority. The aim was to provide a range of autism-friendly, preventative interventions designed to meet the needs of people with autism in a timely and responsive manner, to promote wellbeing and social inclusion, and to prevent people experiencing avoidable crises in their mental and physical health. These outcomes will be delivered by the provision of group and 1:1 interventions targeted specifically at: vocational/employment support (in partnership with local employment services), mental health (in partnership with IAPT), benefits advice, support for carers, increasing social inclusion, physical and emotional wellbeing, along with a range of psychoeducational groups looking at making sense of the diagnosis, relationships, and enhanced social communication skills. Service user feedback from the Advice Service run during the CQUIN has been extremely positive, and is summarised in the attached evaluation report. – the “Level 1” Understanding Autistic Spectrum Conditions courses (half-day) were attended by 66 delegates from across 11 different agencies; 83% were from independent, voluntary and private (IVP) sector employers, including 2 Personal Assistants of Direct Payment Users, and 17% were from statutory sector agencies (South Glos Council, AWP). – the “Level 2” Supporting Adults with Autism courses (1-day) were attended by 15 delegates from across 5 different agencies; 86% IVP sector and 14% statutory sector. Overall, these were disappointing levels of engagement with the training compared to the previous 3 years since the APG initiated these courses. The training programme was re-commissioned for 2015-16 and the provider continues to be the National Autistic Society. We took this opportunity to refresh the overall multi-agency programme and there are now 9 different Autism courses available in the Training Offer, with 20 separate course dates available. The main programme is still the Level 1 course, with 8 different dates when this is running. There is already a marked increase in uptake generally, and particularly among statutory sector agencies and teams compared to the previous year. Based on attendance and booking figures at end Quarter 2, it is anticipated that over 200 delegates will have attended some form of multi-agency Autism training from within this Offer by the end of 2015-16. 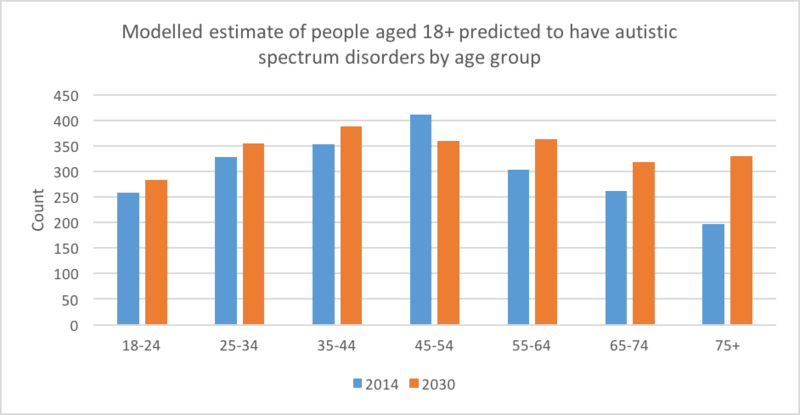 The number of people diagnosed with autistic spectrum conditions is expected to continue to increase and reach over 2300 by 2030. Autism is a national priority. In 2009 the Autism Act to make provision about meeting the needs of adults with autistic spectrum conditions was published, and the publication of a national autism strategy Fulfilling and rewarding lives: the strategy for adults with autism in England followed in 2010 together with statutory guidance for local authorities and NHS organisations to support implementation of the autism strategy. Autism awareness training should be available to all staff working in health and social care and local areas should develop or provide specialist training for those in key roles in order to increase the recognition of autism and enable staff to be better equipped to meet people’s needs. There should be a clear pathway to diagnosis in every area from initial referral through to assessment of needs. Diagnosis should lead to a person centred assessment of need and should be recognised as a catalyst for a carer’s assessment. Improving access for adults with autism to the services and support they need to live independently within the community and helping adults with autism into work. Ensure that a range of services and support can be accessed by people with autism and that most importantly; opportunities for employment and housing are expanded, challenging the current high levels of social exclusion. Improving information about the population of adults with autism and enabling local partners to plan and develop appropriate services for adults with autism to meet identified needs and priorities. The 2014 review highlights fifteen priority challenges for action which have been identified by people with autism, carers, professionals and others who work with people with autism. The following guidelines contain evidence related to autism. The NAS Avon Branch completed a survey in October/November 2014 and received 73 replies. The length of waiting time from referral to appointment for a diagnostic assessment is unacceptably long, and some feel the need to pay in order to have quicker access to an assessment. People with autism would like better access to advice on Money Management, Speech & Language therapy, some Befriending/Mentoring, and more social groups. The quality and choice of support is regarded to be Inadequate. Of those who were working, most had part time, voluntary jobs. There is some evidence of successes, where appropriate on-going support is given by a job coach/support worker with good knowledge of the needs of the person, with reasonable adjustments in place. Better understanding is needed amongst employers. Others felt the social workers didn’t have enough knowledge of autism. More services needed for those who are high-functioning who don’t have a learning difficulty. Financial cuts are affecting services. People with autism are much more likely to experience social isolation, mental health issues, difficulties in accessing employment and often struggle to get the help and support they need from social services. The number of people with Autistic Spectrum Conditions in full-time employment is very low, with research by Barnard et al (2001) estimating that 6% of all people with Autistic Spectrum Conditions are in full-time employment, & 12% or those with Asperger Syndrome of high functioning autism. At the lower functioning end of the spectrum this falls to an estimated 2% rate of employment. Currently BASS (Bristol Autistic Spectrum Service) provides an initial assessment service and ongoing support to people who have a suspected and subsequently confirmed diagnosis of Autism. This service is being reviewed by South Gloucestershire CCG and a business case is being produced jointly between BASS and the CCG. This document will evaluate the effect that this service has had on providing a service to the people of South Gloucestershire and will form part of the CCG’s future commissioning decision of the service it provides. Ensure that the right support for people with autism is available at the right time during their life time. This should include good transition support for young people with autism moving to adult services, and that the changing needs of people with autism are planned for as they grow older. Work with community and voluntary sector partners to promote access to “lower level” local preventative support and activities that enable people with autism to be connected with peers and local community groups. Ensure that the information about support services in South Gloucestershire is available to people with autism is up-to-date and accessible in a way that is appropriate and identifiable. Continue to promote and monitor the South Gloucestershire multi-agency Autism Training Offer and ensure that autism awareness training is available to all frontline staff so that they are able to identify potential signs of autism and understand how to make reasonable adjustments in their behaviour and communication. Ensure that GPs, as the gatekeepers to diagnostic services, have adequate training and information available so that they have a good understanding of the whole autistic spectrum and the local diagnostic pathway and how to refer. Work towards achieving NICE best practice for access to diagnostic services; where people seeking an autism diagnosis have a first appointment within 3 months of their referral as set out in the NICE Quality Standard on autism [QS51]. Work with all local service providers to develop and improve methods of data collection to ensure that the numbers of people with autism in their area of responsibility are appropriately recorded and analysed, and information about need (health, social care, education, employment, housing) is captured. Commissioners and service providers should use this information to develop and improve services. Work with local employers, colleges and support services to ensure that there are employment opportunities for people with autism in South Gloucestershire and that appropriate support is available to help people with autism to find and keep a job. There is a need to better understand the needs of people with autism in South Gloucestershire to ensure that we have identified the gaps in the service that we provide. To this end a full needs assessment needs to be undertaken and this must include the links to access to mainstream MH services, the South Gloucestershire Talking Therapies service, Social Care provision as well as the transition into adult services and clinical pathways affecting this cohort of people. The South Gloucestershire Autism Needs Assessment considers both autistic adults and children and can be found on the Autism page on The South Gloucestershire Council website.